As a small wildlife charity with a wide range of disciplines, we are proud of our outreach programme and the assistance that we have given to the local communities. Over the past year the George Adamson Wildlife Preservation Trust in Germany (GAWeV) has been actively raising funds for upgrading schools and we would like to thank Simone Motzko for her help with this. GAWeV has donated money for roofing sheets for the Kankokoro Secondary School (a new school from a merger between the Ndungu Secondary and Kihurio Secondary Schools), cement and roofing sheets for the Kivingo Primary School and the Lunguza Secondary School. Simone also visited with a film crew and actor Erol Sandler to officially hand over the building materials and to make a short documentary to promote the outreach programme in Germany and the Von Langsdorffs have also agreed to assist with PR and our website. 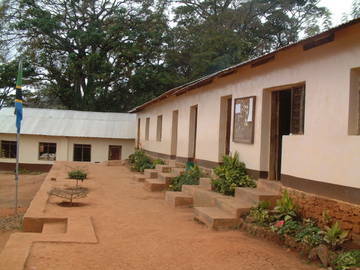 GAWPT in the UK raised funds from a charitable foundation for cement and roofing sheets for a further six primary and secondary schools spread over Same, Mwanga and Lushoto Districts. Currently we have donated cement and roofing sheets to Vudee Secondary School, Marindi Suji Secondary School, Shighatini Secondary School and Pangaro Primary School. Suji Secondary School told Elisaria that this was the largest donation they had ever received. We have also made further donations of cement to Kivingo Primary School and Lunguza Secondary School in Lushoto District and Mapanda Secondary School, Mkomazi Village in Korogwe District. GAWPT has also raised the funds for the construction of the Hedaru Secondary School library (cement bricks, walling cement and roofing sheets). The Headmaster has already funded timber, labour costs, painting and electrical fittings, so this joint project should be completed within the year. GAWPT has also donated building cement for the Roman Catholic Secondary School in Same, and building materials for the Same District Council rest house. 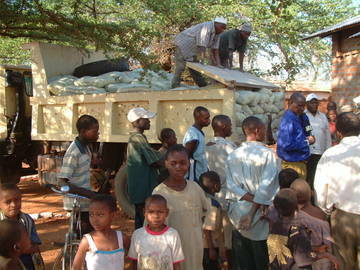 We have helped Kisiwani Secondary School with the use of our tractor to bring in building sand for more classrooms. The borehole and water pump funded by GAWPT and the WD at Zange HQ continues to provide water twice weekly to the villagers of Majevu. Tony and Elisaria have held continuous discussion with the new District Commissioner of Same, Ibrahimu Marwa, and we have kept in close communication on all outreach initiatives. Elisaria has also been in discussion with the District Commissioner and District Administrative Secretary of Mwanga District and Lushoto District. Representatives from GAWPT have taken stalls on the Same Exhibition Days to show the people of Same the work of the Trust. GAWPT, TUSK, Save the Rhino and Chester Zoo have joined forces to fundraise for our new Environmental Education (EE) Programme. A fundraising dinner was held in London by SRI and TUSK to get the project off the ground and provide running costs in the early years. The evening was a great success and we are grateful to all those who helped put it all together. GAWPT will send the EE Officer and the bus out to the villages to talk to school children and community groups about their environment, the Mkomazi Project and wildlife conservation, particularly black rhino. 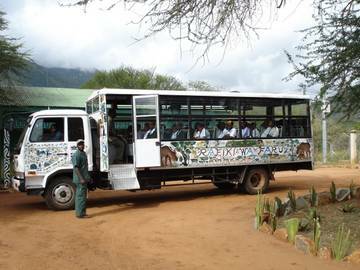 GAWPT will also facilitate visits by schools to MGR and MRS. TUSK, having benefited from charitable fundraising in the City of London have paid for the bus which has been built to our specification in Kenya and has recently arrived in Tanzania. In the meantime, one of our personnel has been trained as a bus driver!! With TUSK’s hep again, we received a donation from elephant.co.uk which is enabling us to construct a wonderful education centre (pictured) in the MRS where the school children can watch films (audio-visuals donated by TUSK/Vodafone Pace) and be taught about conservation initiatives as well as seeing MRS personnel at work. The bus is being painted in traditional Tanzanian ‘tinga-tinga’ style. Our partners are contributing to the strategy framework, educational materials, inter-active activities and running costs for the whole programme. Elisaria has visited Laikipia Wildlife Forum with Mark Pilgrim and Maggie Esson of Chester Zoo to see how a similar programme is being run. 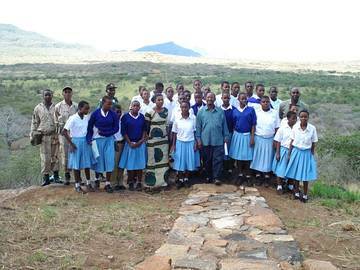 The overall EE Programme has been and continues to be developed for the benefit of local communities, especially the school children, as through this initiative they can be actively involved in local environmental issues and wildlife. Finally, with great enthusiasm Mandy Swanne has designed and established an interactive and educational blog called Dotty Rhino, aimed at children but enjoyed by adults.